What is Mixed Media Art? Anna Schuleit Haber, Electrologe, Mixed media on paper, framed, 37 x 29.5 in. The term “mixed media” is used to describe artworks composed of a combination of different materials - and this could be a wide range of items. While the term itself is relatively new, the practice of combining different media dates back to antiquity. Mixed media isn’t a modern phenomenon. What we consider today to be "mixed media" has developed from less experimental methods and materials-- think Leonardo DaVinci mixing pastels with ink or Degas combining pastels and charcoal, to what we see today, which often goes beyond traditional artistic materials to include unconventional materials and objects - from aluminum to zippers to slices of bologna, anything goes! Because it is a continuously evolving form, mixed media allows for a liberty of expression, and often emphasizes process as much as product. As you walk through our current exhibition, Scientific Purposes, you will see the term 'mixed-media' used for every painting on view. For Schuleit Haber, mixed media includes acrylic, ink, oil pastel (but no oil paint), and charcoal/graphite. The lightweight graphite etchings meet the more colorful acrylic brushstrokes, when combined together a story is created. Each painting differs in amounts and inclusion of her mixed media elements, and you can view all the work at the gallery through April 15, 2018. Preview the artworks. Holly Harrison, Time Is a Story (2017). mixed media on wood panel. 36 x 36 in. Holly Harrison’s mixed-media pieces focus on the interplay between organic shapes and repeated geometries. She creates collages on canvas using unique, personal materials including samples of drawings made by her daughter, old paintings on canvas paper by her husband, and strips of semi-transparent screen mesh. By weaving these materials together on canvas, Harrison achieves a cohesive image that reflects her poetic sensibilities. “There’s a resonance that happens between each piece to create a whole experience,” she says. “I wanted to create a dialogue between all the different elements.” The interplay of different materials contributes to the texture of the piece and reveals a personal narrative tied to the themes of place, time, natural history, and the nature of memory. Lisa A. Foster, A Way To Start (2017). cotton reproduction quilting fabrics, acrylic paint and medium on canvas. 60 x 60 in. Acrylic paint and textile converge in Lisa Foster’s 2-D pieces, presenting to the viewer the lives of women through the configuration of their bodies. Her use of quilt fabrics as something that is solidly built inverts the typical application of textile, and transforms the decorative into a striking fine art medium. Foster says, “I am using fabrics not to decorate but to make something solid like rubber, poured paint or steel. I do not consider my work collage. I like shaping space, like [Richard] Serra.” Through her work, Foster demonstrates how a mixed-media approach can alter the traditional use of a material to produce a visual effect and elevated purpose. Kristina McComb, Lacy Pathways (2015). steel, plexiglass, and transparent film. 14 x 10 x 7 in. 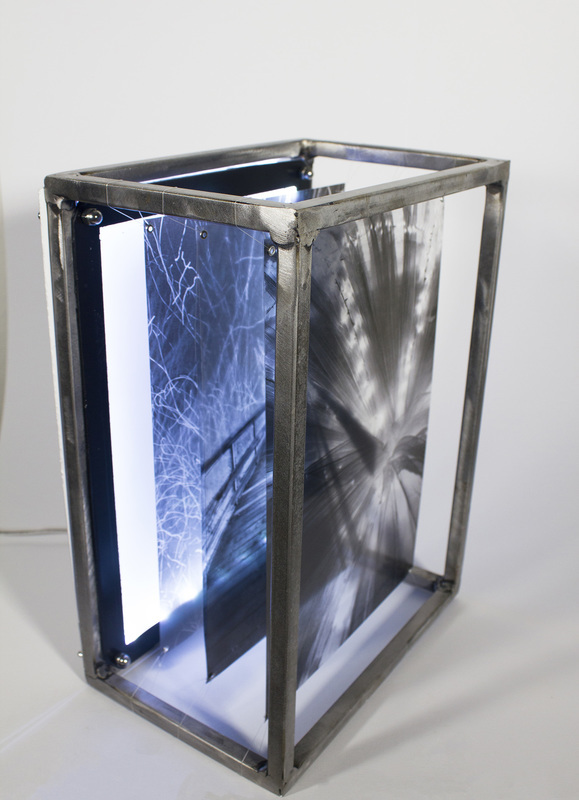 Kristina McComb combines photography and sculpture in her series of multi-media “light boxes." McComb layers her images, printed on acetate, and suspends them in backlit, steel structures. The manipulation of light and unique printing method allows the photographs to drift and overlap, creating an image that is both fragmented and cohesive, and changes depending on the perspective of the viewer. The overlapping and layering of different images blurs the line between past and present, thus imitating the fragility and impermanence of time as a concept. Not only can mixed media include the incorporation of unexpected or unconventional materials, it can also allow for artworks to merge different artistic disciplines from sculpture to photography to installation, and more. There are no boundaries. Todd Pavlisko, Dollar (2017). retail tag fasteners on canvas. 18 x 15 in. Todd Pavlisko captivates the viewer with his artworks that reveal an unexpected approach to mixed-media art. In his ongoing tag series, Pavlisko uses colored retail tags, each individually pierced through the canvas, as an unconventional medium that explores Pointillist techniques on Pop Art subjects. The tags, all made in Korea, are a poignant critique of American consumerism and social values. Pavlisko’s use of repurposed retail tags is an example of how the materials in mixed-media artworks can be pivotal to communicating the artist’s message. His unconventional use of repurposed retail tags on canvas is highly textural and avoids being classified as any singular art form--it is collage, painting, and sculpture all at once. Mixed media allows artists to continue to push the boundaries of art through the use of non-traditional media. The one catch: the term captures a wide range of definitions. If you are curious what elements make up a certain artwork, be sure to ask the gallerist or museum attendant for details.